What is it about World War I that garnered such a deluge of superb war poetry? There has been wars since man stood erect and poetry almost as long? So what was the magic held by those predominantly British soldiers that enabled them to capture horror and dread in such introspective confines as verse? In reading this Penguin collection, I found that neither Wilfred Owen nor Siegfried Sassoon were the best poets...that distinction must go to Edmund Blunden, whose poetry is both probing and compelling in a way that easily translates into today's reality vernacular:"Its wounded length from those sad streets of warInto green places here, that were my own;But now what once was mine is mine no more,I seek such neighbours here and I find none.With such strong gentleness and tireless willThose ruined houses seared themselves in me,Passionate I look for their dumb story still,And the charred stub outspeaks the living tree." "What passing bells for these who die as cattle?" Picked this up after singing the Britten War Requiem and experiencing the power and depth of emotion in Wilfred Owen's poetry. Took me forever to read, but it's an incredible collection. ‘He is risen now that was long asleep,Risen out of vaulted places dark and deep.In the growing dust the faceless demon stands,And the moon he crushes in his strong, black hands.’The German poet George Heym’s 'War’ was written in 1911 - predating the Great War but also prefiguring the poetry that arose from it. In 1912 Heym also wrote ‘Why do you you visit me, white moths, so often’ which concluded with the lines:‘Who opens the countries to us after death?And who in the gateway of the monstrous rune?What do the dying see, that makes them turnTheir eyes’ blind whiteness round so terribly?’The First World War had many prophets: geopolitical thinkers who believed a reckoning between Empires was inevitable; ‘race theorists’ who thought that soft Europeans could only reinvigorate themselves through war; war novelists with fantasies about their countries being invaded. This collection of First World War Poetry also shows that poets were aware of the horrific possibilities of future war prior to 1914. And they were not all taken with ‘war fever’ or patriotism. One interesting detail I learned from this book is that the famous lines from Rupert Brooke’s ‘The Soldier’‘If I should die, think only this of me:That there’s some corner of a foreign fieldThat is forever England.’Is actually a copy of the decided less patriotic ‘Drummer Hodge’ by Thomas Hardy (set during the Boer War)‘Yet portion of that unknown plainWill Hodge forever be;His homely Northern breast and brainGrow to some Southern tree’This is mainly a collection of English poets, but includes Germans, French, Italians, and Russians. There are only two women in this edition: the Russians Anna Akhmatova and Marina Tsvetaeva. Editor Jon Silkin doesn’t reference Paul Fussell’s ‘The Great War and Modern Memory’ - and doesn’t seem to hold with Fussell’s arguments about the War bringing a fundamental cultural shift away from Romanticism to harsher, more ‘modern’ aesthetics. Instead he emphasises the continuities of English World War One poets with Shelley, Keats, Wordsworth, etc. However something not continuous between the War poets and the Romantics is that the latter were more sceptical of patriotic calls to conflict. For example, Shelley in the ‘Revolt of Islam’ writes‘We all are brethren - even the slaves who kill’Whereas the far too often repeated ‘In Flanders Fields’ by John McCrae concludes (after the misleadingly pacifistic sounding ‘We are the Dead. Short days ago/We lived, felt dawn, saw sunset glow’)‘Take up our quarrel with the foe: To you from failing hands we throwThe torch; be yours to hold it high.’The First World War poets often combined ‘jingoism’ with a somber awareness of the consequences of war. At its worst this combination comes across as a cult of death - ‘our glorious dead’ forever judging the living on whether we measure up to their sacrifice. However the sheer scale of industrialised warfare exemplified by the First World War demonstrated that individual bravery, valour, or sacrifice mean very little if everybody is being mown down by machine guns - hero or coward alike. The nations that fought in the First World War are now far more likely to do ‘remote’ warfare: through specialists, private contractors, and drones. Modern warfare’s contradictions, as articulated in First World War poetry, are just too much to bear. 8/23/11: Jeezus, this took forever. I couldn't review this if I tried b/c it ended up being the book I carried around for reading on the subway, and I don't actually go into the city that much, so I'm rarely on the subway. The introduction was really long, and the editor suggests that Rosenberg is the superior poet to Owen (the other "great" WWI poet), but I liked Owen's poems the best. I would like to read more of his work. This was also a lesson that I can't read big collections of poetry. I need to read little bits instead. (See what happened to my reading of the Anne Sexton collection, for example. )3/18/11: Ever since my first English Comp class, I've noticed this deep affinity for the literature, especially the poetry, and history (and later the art) of the First World War era. It affects me so profoundly (and in such a personal way, with such an odd intensity), that I always say that if I believed in reincarnation (I don't. ), I would swear that I was a soldier in the Great War in a previous life. I've only just started the introduction to this volume and I'm already entranced. One of the books from my semester-o'-world-war-one, in the spring of 1990. This one was, I think, from the English class, though it may have also been assigned reading for the history class as well. The poetry itself runs the gamut, from the conventional and sentimental "pep" works from early in the war (some from poets, like Rupert Brooke, who died before ever seeing combat at all, and others from poets too old for combat, like Kipling), to full fledged "trench poetry" by the likes of Wilfrid Owen, Robert Graves, and Siegfried Sassoon. There is also a nice sampling of work by German and French Poets. There isn't much in the way of effective commentary or organization, but the raw material is all here, at a moderate price and a convenient size. There were a huge number of lives sacrificed in vain in the first world war. Some of them were poets of the highest caliber. Other great poets survived the battles and returned home. Whether you are reading the poetry of someone who died in the war, or survived, this collection is one of the most moving you will ever read. Highly recommended. I always like to dip into this in the run up to Rememberance Sunday. It's a good way of reminding me of what those men went through, physically and emotionally, almost 100 years ago. This collection has both the classics and some lesser known poems and includes poets from both sides of the conflict. The total denuntiation of war that is contained within these pages is without parallel. I can't think of anything that contrasts more than poetry and war - the two are mutually exclusive. No pompous declarations of honour by Tennyson here; just a grim reminder that war is not glorious. It is blood, gore, death, fear and insanity. This is a great collection by different authors, including some translations of German war poets which is a nice touch. Skip the lengthy and boring introduction and just read the words of the men themselves. This was a rather dichotomous read. The introduction by the collection's editor took the first 77 (!) pages & left me wondering if it had not been a doctoral thesis for him at one point. As a result, it slowed me considerably at the outset, but once I got into the poetry itself, I was off and running. There were many familiar poems, to be sure, but it was still a worthwhile read in this, the 100th anniversary year of the U.S.' entry into WW1. Wars, good and bad, are ugly, de-humanizing, soul-destroying things. This is indisputably true, both history and literature gives proof to this. Yet the preponderance of bad or unnecessary wars to necessary ones in the world’s history is aided and abetted by a willful disregard of this truth. Homer and the Greek tragedians made it clear. So too have writers who write from witness ever since. The testimony from the First World War, the so-called Great War (great because of its size not because of its purpose, which remains something between a mystery and an absence of purpose), is particularly and relentlessly compelling on the brutality and folly of war. It may have been one of the last wars where everyone turned out to fight without exemptions and deferments for the powerful, the wealthy, the academic, the artistic. The poor, of course, were there as they always are, but it is remarkable how many young men of privilege were not just in the service but on the front lines. (They don’t matter more; they just provided a testimony that reached audiences that were broad at the time and that continue to reach across time.) Fiction and poetry both benefited from this testimony of experience. This superb anthology captures that and it includes many poems that should be required reading in school and college, particularly given that political leaders who send our young men and women off to war now are almost never veterans of the military. Not that being a veteran guarantees a sober, less impulsive and shallow approach but foppish callowness is less likely. Compare John McCain and Donald Trump on war and torture and note that Cruz, Rubio, Bush, Christie all sound more like Trump than McCain. Read memoirs by all means for a real taste of war. But also read Homer. And read Edmund Blunden, Igor Gurney, Robert Graves, Edward Rickwood, Richard Aldington, Herbert Read, Ford Madox Ford, Georg Trakl, Anton Schnack, Rene Arcos, and, of course, Owen, Sassoon and Rosenberg. There are more in this not very long but nonetheless rich volume. A surprising number did not survive the war and there is credibility and immediacy that comes of that reality. But even those who survived wrote poems in the moment and the immediate aftermath, not years later. It is art and journalism wrapped beautifully and poignantly together. The collection represents a range of voices and perspectives and countries of origin (England, Australia, Wales, America, Canada, Germany, Italy, France, Russia, and China). Women poets are included, almost reluctantly, alas. That and a few of the more modernist poem choices that are less about the war specifically but about life and art were the only weaknesses I found with the book. The anthology is filled with brilliant poems that capture the range of war from optimistic patriotism, parades and comradeship, to fear and boredom, violence and death, which despite changes in technology is as grim and brutal as Homer or the modern battlefield, the unendurable filth and cold, the many simple small joys in moments of calm and relief, the grim reality of medical stations and hospitals. Collectively it’s an immersive experience that gives the reader an opportunity to respectfully learn what we ask soldiers to endure and inflict, a learning that should give us pause when anyone sends others off thoughtlessly or giddily to war. Having written an amazing essay on WW1 poetry for my GCSEs I thought I knew about this stuff. Turns out I should've paid more attention to the critics who harshly savaged my lengthy dissection of 'If I should die...' with a 3 out of 10 and a scraped 'C'.However my groundwork in disappointment stood me in good stead because once I'd managed to wade my way through editor Jon Silkin's dense intro it now all makes perfect sense. Obviously as he's choosing the selection, the poems neatly illustrate his theories, particularly the move from patriotism to numbed brutality and the underlying sense of doom that was equally present in the German and French trenches as the good old Tommy.What was more interesting/moving wasn't the mud and blood, but the more modern, stream of conscious poems seemingly not about war but laden with portents, like the extracts of Jones' 'In Parenthesis', the brilliant Edward Thomas and Herbert Read. Now all I've got to do is invent a time machine, go back to school and rewrite that essay. Obvs I wouldn't stop the war... what would I do with this newfound info if there wasn't a war? The view of war in this book was really depressing, however you can really understand how war affected so many soldiers. The prominent theme in the poems was often about the lost of innocence, which results from the soldiers seeing lives lost and blood shed right in front of their eyes. My favorite poem was "Everyone Sang" because it showed how the aftermath of World War I really took a toll on the United States. The poetry here, really explored all of the feelings during World War I, as there's poems about after the war, during the war (in the city during wartime) and in the war. I found some especially sad, like "Lamplight" which seemed to be about a soldier losing his best friend in war. This one I felt was the one that made me feel the most emotional as a bond becomes broken because of war. All in all, the poems seemed to only scratch the surface of what World War I had really done to people, as a lot of emotion was put into all of the poems. I particularly appreciate the focus on the development and changes in poetic form, tone, and timbre that the editor uses to shape this anthology. Including diverse voices and utilizing poets both popular at the time and who gained attention posthumously and/or after the war, this collection is large and thorough, though never complete since there was a profusion of poetry written from this war. A fine volume to read and reflect upon, meeting these men and women trying to make sense of what is often cruel and permanently wounding. Really good, comprehensive anthology of poems. This will definitely become a staple for me! !I particularly think the foreward is fantastic and I like how the poems are categorised. It makes for much easier searching for themes and helps to find poems you weren't necessarily familiar with beforehand. This is an emotionally searing collection of poems, which can make this a tough read at times. The words of Wilfred Owen and Siegfried Sassoon are here joined by lesser-known poets like Isaac Rosenberg, as well as poems presented in translation. Particularly welcome is the addition of some poems by women and other noncombatants. 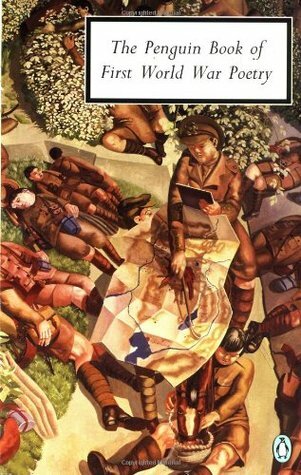 With contributions from a diverse range of people including war poets Wifred Owen and Siegried Sassoon and authers D.H. Lawrence and Rudyard Kipling this book contains a respectable selection of poems. If you haven't got into poetry but would like to try it without comitting to one writer then you could do worse than read The Penguin Book of First World War Poetry. Read and weep. By the end of the slaughter, even the arch-jingoist Rudyard Kipling--who had lost his son-- was writing "If any question why we died/tell them, because our fathers died". The collection only focuses on British poets, but I can't imagine reactions from other combatants to be much different. All in all, a good collection of WWI-era or -inspired poetry. It's beautiful, wrenching stuff that, quite honestly, is difficult to read sometimes. I appreciated the selection's broad range, which included French, German, Russian, Italian, and female voices. Colección de poesía anti belicista escrita durante o con motivo de la I Guerra Mundial por poetas británicos o traducida de poetas franceses, alemanes, italianos y rusos. Aunque el tema es común, el enfoque varía del más generalista hasta el más concreto, destacando el detallismo de los alemanes. Some of the most moving poetry every written. Includes, but goes way beyond, the usual suspects. As we approach the centenary of the outbreak of the War to End All War this ought to be on everyone's reading list. Brilliant book of poetry that really got my thinking about waste, fear and WWI. Big influence in writing a novel set in WWI. HIGHLY recommended to the point that I can't imagine not having read it (and I rarely say that). Even if poetry is not your "thing" take a look. I always think, how sad to be able to write such moving words.. I particularly enjoyed the work of wilfred owen and how he exposed the horror and stupidity of war in such work as, dulce decorum, and , anthem for doomed youth. This book brings the war to life and really underscores the emotions that accompanied people onto the fronts. Death, mud, gas, mud, death, more death, trench-foot, gas and, err, death.An anthology of tortuous and depressing stanzas.